Caveman Keno - Play Online - Casino Answers! Caveman Keno is a popular variation of the well-established Keno casino game. 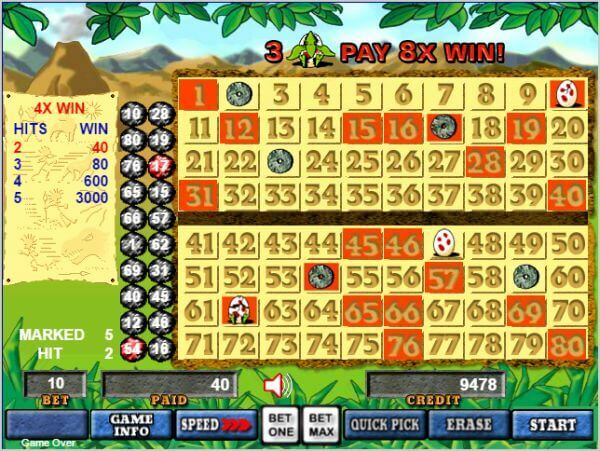 It is the same as the conventional keno game whereby a player places his/her bets by marking 2 – 10 numbers and then wait for the computer to randomly generate 20 numbers. If the player’s bet happens to have hit a certain amount of the numbers generated by the computer, then he/she wins. However, the main difference with Caveman Keno and the regular keno is that the game chooses three numbers before the draw and if at least two of these numbers matches the 20 numbers that were generated randomly, the player will win a multiplier. The game comes with a variety of features intended to ensure players have a good time. One of which is a graphical user interface that represents the name of the game appropriately with various prehistoric creatures and environments along with an extra egg bonus that gives players a chance to win a higher payout. – Great landscape backdrops with a theme that centers on the prehistoric period. – Funky background music that gets the player into the playing mood. – Bets, pay and credits well displayed for easy and quick viewing. – Updated sounds that make players feel like they are in the caveman world. – Full statistical database with the ability to track plays as the players go along. – Easy play session that motivates players to play the game over and over again. 1. The Player begins by selecting 2 – 10 different numbers between 1 – 80 and then wait for the game to begin. 2. The video machine will then generate three random numbers from the numbers which the player did not choose from. The numbers will be attached with dinosaur egg graphics. 3. The machine generates 20 random numbers from 1 – 80 and if the numbers match those that were chosen by the player, then he/she wins. 4. If the numbers with dinosaur egg graphics match any of the 20 random generated numbers, then the player’s win will be multiplied accordingly. If there are 2 matching dinosaur eggs, then the player will win 4 times the winning number. If all the dinosaur eggs match, the player’s winnings will be multiplied by 10. Caveman Keno stands out from the regular Keno games because of its unique graphical user interface and egg multiplier features. Playing it feels really fun and exciting as you experience the prehistoric time period while also enjoying a new revamped version of the classic keno game. The new twist it offers which allows a player to transform 3 numbers into dinosaur eggs that can help to double or triple the winnings feels extremely rewarding and well worth trying your luck on. The game is really good for people who are looking to test their skills in a new and exciting way or for fans of the original keno game who would want to experience a new version of it. Not only does the game offer many good betting options, it also motivates players to try their hand over and over again until they become a professional Caveman Keno player. Whether you are new to keno or a seasoned player, Caveman Keno will ensure that you remain completely engaged while having lots of fun even when you don’t necessarily win and stands out as one of the most enjoyable and worthwhile casino games available today. At this time there are no online casinos which offer the ability to play Caveman Keno for free or for real money.